Humber has introduced a wide variety of intelligent solutions for reducing energy consumption on campus. These green energy initiatives support Humber’s 'triple bottom line' strategy by minimizing the College’s environmental impact and GHG production, generating cost savings and helping to conserve the world’s non-renewable energy resources. Humber has developed our 2014-2018 Energy and Water Conservation and Demand Management Plan as a result of the more recent Ontario Regulation 397/11 under the Green Energy Act. The plan seeks to extend the gains we have already made while aligning tightly to one of our college value of Sustainability. Check out the reports on our Publications page to learn more about our goals in this area. 2015: The newest building on the North Campus, the Learning Resource Commons (LRC), has 100 kW of electricity from solar photovoltaic cells and a green roof. 2012: Four demonstration photovoltaic (PV) systems (three fixed and one tracking) are located on the roof of the L-Building, North Campus. Humber students use online monitoring tools to measure energy and compare performance of the fixed and tracking systems. 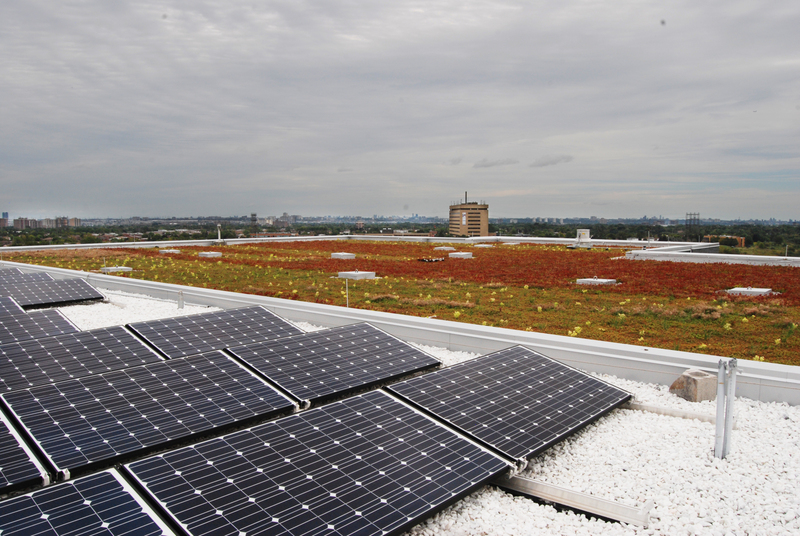 2010: 28 solar panels were installed on the roof of the Skilled Trades Centre on Carrier Drive, with meters to measure energy production. 2003: Heat Recovery Ventilator (HRV) rooftop units were installed in two Lakeshore Campus student residences to recover heat from air exhausted by kitchens, washrooms and laundry facilities. The recovered heat is used to preheat incoming air, lowering power demands and costs for heating the building.